Collecting Oysters Marine scientist Rita Crockett collects oysters from Mockhorn channel on the seaside Eastern Shore of Virginia. Photo by Ryan Carnegie. Sorting Oysters Ryan Carnegie and marine scientist Nancy Stokes sort oysters at Aberdeen Rock on the York River in spring 2011. Photo by Rita Crockett. Spring Imports Professor Gene Burreson and VIMS graduate student Kristina Hill prepare to deploy Spring Imports into the York River in spring 2011. Photo by Ryan Carnegie. Spring Imports "Spring Import" oysters in rack-and-bag systems on the VIMS beach in 2009. Photo by Ryan Carnegie. Histopathology Marine scientist Rita Crockett evaluates histological sections of oyster tissue for the presence of MSX and dermo in the lab at VIMS. Photo by Ryan Carnegie. Haplosporidium nelsoni A histological image of Haplosporidium nelsoni (MSX). The pink refractory bodies are MSX spores in oyster tissues. Image by Dr. Gene Burreson. Development of disease resistance among Chesapeake Bay oysters calls for a shift in oyster-restoration strategies within the Bay and its tributaries. That’s according to a new study by researchers at the Virginia Institute of Marine Science. 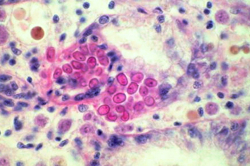 MSX is caused by the single-celled parasite Haplosporidium nelsoni. It first appeared in Chesapeake Bay in 1959, combining with overharvesting, declines in water quality, and a second parasitic oyster disease known as Dermo to push the Bay’s oyster population to one percent of historical levels. Both MSX and Dermo favor the saltier waters of the Bay’s main stem, decreasing in prevalence as one moves upriver into the fresher waters of Bay tributaries, which form a safe haven from the parasites and diseases. To date, restoration strategies have rested on the idea of protecting these “low-salinity refugia” as sources of larvae for replenishment of disease-ravaged populations in saltier areas of the Bay. These strategies are based on the high levels of mortality traditionally seen among oyster populations in saltier waters (initially more than 90 per cent), and computer models showing that tidal currents can indeed carry oyster larvae downriver from fresher to saltier areas. Carnegie says “there’s been a lot of attention given to these up-river, low salinity refugia. They’ve been viewed as the key source reefs that are exporting larvae into the higher salinity waters.” Disease-ravaged reefs in higher salinities have been valued primarily for their fishery, which has sought to harvest doomed oysters before they succumbed. Carnegie and Burreson’s research, however, paints a different picture. They’ve found clear evidence that oysters in the Bay’s saltier waters are developing resistance to both MSX—the focus of their paper—and Dermo, despite the increasing prevalence in the Bay of the parasites responsible for the two diseases. This is only possible through reproduction by resistant oysters in high-disease areas, thus their call for a focusing of restoration efforts onto these disease-resistant areas and populations. Carnegie says "We basically need to confront the diseases head-on where they are most active, rather than avoiding them by working in low salinities. It’s in the high-disease areas that resistance is developing most rapidly, so restoration efforts should be focused there." In fact, Carnegie and Burreson point out that restoration efforts focused on low-salinity refugia may actually be counter productive. Carnegie says “our study makes very clear what happens when oyster larvae from the low-salinity refugia settle in high salinity waters—they are removed quickly by the parasites because they are produced by genetically naïve parent oysters that haven’t been selected for disease resistance.” Genetic mingling of these susceptible oysters with their disease-resistant counterparts may be acting to slow the spread of disease resistance through the Chesapeake Bay oyster population. The pair’s research was supported in part by the A. Marshall Acuff, Sr. Memorial Endowment to the VIMS Foundation, which has supported oyster disease research at VIMS for almost 30 years. Carnegie says, “Our team really appreciates the flexibility Acuff support gives our program—the ability to rapidly respond to emerging questions, pursue new directions, and build the foundation for larger, extramurally funded projects.” Acuff support has played a key role in the renewed commitment to native oyster restoration, and has leveraged federal funds and created jobs for Virginia citizens.